The Thirupanamoor Jain temple was built by the local Jains in the fifteenth century AD. This temple is located in the village of Thirupanamoor in the Tiruvannamalai district of the state of Tamil Nadu. The architectural structure of this temple is composed of a corridor that is surrounded by a compound wall. The main entry of this temple is east facing and is surmounted by a small tower. The starting location of the corridor has the footprints of twenty four Tirthankaras. The middle portion of the corridor is known as the Vedi block. The sanctum of the holy area is composed of two stages, one containing viman with shikhara and the other containing a kalash. The first stage has four Tirthankaras in the sitting posture situated in the four directions. The second stage consists of the four Tirthankaras in the standing posture. The vedi pedestal consists the idol of Shri Pushpathanthar. The idol is made up of lime mortar having eight features of Samavasaran Jinar. Then there is an Arthamandap. This place contains all the idols of Tirthankaras that are made up of metal. The idols include Shri Bahubali which is being covered by Praba structure,Shri Parswanathar, Panchaparameshti, Navadevatha, Sruthaskandam, 72 and 24 Thirthankars cluster, Yakshas, Yakshis that are being exhibited on a wooden bench on both sides of the arthamandap. The temple contains a main mandap or place of worship that is known as the Mahamandap. This mandap consists the stone idol of Shri Pushpathanthar having eight features, and this idol is used for the daily pooja and worship. In the north side of the pavilion statues of Shri Dharanendran, Shri Parswanathar, Shri Padmavathi, Shri Brahmayakshan, and Shri Jwalamalini made up of stone are arranged on a high raised platform. 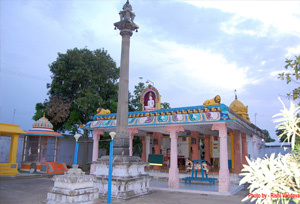 The nearest town to this temple is Kanchipuram and is well connected by bus from all the major cities.